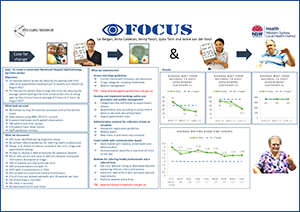 To reduce the time between referral to Westmead Hospital ophthalmology outpatient clinics and first appointment, from 12 months to six months by August 2017. To reduce the time between the patient’s arrival at the clinic to seeing a doctor, from four hours to two hours by August 2017. Improves access to ophthalmology outpatient clinics. Reduces waiting time and improves patient flow through outpatient clinics. Increases patient satisfaction and streamlines their healthcare journey. Enhances staff satisfaction and communication across departments. Provides staff with evidence-based guidelines to triage and prioritise patient bookings. Improves the collection of patient data on arrival to outpatient clinics. Increases health professionals’ knowledge of clinic referrals and processes. The Westmead Hospital ophthalmology service is located in Western Sydney Local Health District (WSLHD), which is projected to be the state’s most populous local health district by 2021. WSLHD features several pockets of extreme socio-economic disadvantage, as well as high rates of diabetes. The population growth and increasing complexity of medical conditions in WSLHD has increased the demand for ophthalmology services in recent years. As a designated NSW Health Eye Specialty Centre, Westmead Hospital offers a comprehensive range of specialised eye services. However, an audit conducted in September 2016 found that some people were waiting more than 12 months for an appointment. There were no documented criteria for triaging referrals, or systems that allowed staff to manage waiting lists. Staff reported anecdotally that long waiting times were resulting in people presenting to the emergency department (ED), particularly if their condition was worsening. As a result, 28 per cent of outpatient appointments in September 2016 were ‘walk-ins’ from the ED. Experience in managing outpatient clinics led staff to believe that the longer a person waits for an appointment and the larger the gap between the appointment notification and the appointment date, the higher the did not attend (DNA) rate. Prior to the project, some people were being notified of their appointment 12 months in advance and in September 2016, the DNA rate was 24 per cent. A patient survey conducted in September 2016 found that waiting times in the clinic were also an issue. Sixty per cent of patients reported waiting longer than two hours to see a doctor, with some reporting a six-hour wait. As a result, there were a number of complaints at a local and state level regarding waiting times for an appointment and within the clinic. It was determined that reducing these waiting times would increase access to the clinic, improve patient flow and provide a better care experience. Access and triage guidelines were developed in collaboration with senior ophthalmology staff. These aligned to triage categories and included clinically appropriate waiting times, to give referring clinicians a guide as to which conditions are best managed by a specialist and which can be managed by an optometrist or the patient’s general practitioner. A booking policy and procedure guide was developed to improve waiting list management. It included a comprehensive analysis and modelling of clinic activity. An appointment schedule was developed, to ensure patients are seen within their allocated triage category time frame. This provides sufficient appointment spaces for new, follow-up and urgent patients. It also considers the multidisciplinary nature of the clinic, where patients are often seen by several doctors, to ensure there is an efficient use of human resources. An administration protocol for the collection of patient data at reception was implemented, including Medicare, financial and patient contact information. This allows staff to improve triage and more accurately estimate the patient’s time in the clinic, by reviewing the check-in (arrival) and check-out (departure) times noted on their electronic medical record. A multidisciplinary team huddle was implemented at the beginning of each day, to orient staff (particularly doctors) about who is on their team that day. A new communication board was also established, to provide a snapshot of the day’s activities, staffing, available clinic appointments, and contact numbers of interpreters and correctional patients. A website for referring health professionals was developed, outlining eye clinic services available, clinic team members and referral guidelines. Average waiting room time reduced from more than four hours in September 2016 to 2.8 hours in July 2017 (target two hours), with 46 per cent of patients reporting that they were seen by a doctor within two hours. Average wait time from referral to first appointment (category 1 patients) was 15 days in June 2017 (target 30 days). Average wait time from referral to first appointment (category 2 patients) was 43.5 days in June 2017 (target 90 days). Average wait time from referral to first appointment (category 3 patients) was 365 days in June 2017 (target 365 days). The rate of overbooked clinics reduced from 80 per cent in September 2016 to 24 per cent in July 2017 (target 20 per cent). The rate of walk-ins reduced from 28 per cent in 2015/16 to 13 per cent in July 2017 (target 15 per cent). Rate of DNA appointments essentially remained the same: 24 per cent in September 2016 and 25 per cent in July 2017 (target 15%). It is expected that the DNA rate will show a decline in August 2017 due to improved waiting list management. Patients with recorded discharge information increased from 1 per cent in September 2016 to 10 per cent in July 2017 (target 20 per cent). Check-in and check-out increased from 0 per cent in September 2016 to 98 per cent in July 2017 (target 100 per cent). Complaints about waiting time have reduced at a local and state level, and staff morale has improved. Patients and carers saved 7,449 hours of waiting time from November 2016 to July 2017. The website for referring health professionals will be evaluated in January 2018, through the number of referral guideline and template downloads, as well as the number of website visits recorded. Planning is key at every step of the redesign process. It is important to understand the problem before solutions are created, and engage staff and patients so they can support you through the process.